When SketchUp was invented more than a dozen years ago, our team envisioned a tool which was simple to learn and simple to use, but powerful and capable of building complex models of all kinds of real world things. SketchUp, we dreamed, would be a tool which made designing, building and operating things easier, faster and more efficient. Maybe, even, more fun. Make simple shapes, turn simple shapes into complex shapes. Make groups and components to organize the geometry and information in your model. It's the SketchUp Way. The key to that dream was an arsenal of simple and direct modeling tools coupled with a plastically flexible and 'sticky' geometry model. Editing a model should be as simple as touching a face and pushing and pulling it into shape. The SketchUp Way was born. Almost. The wonderfully creative pure plasticity of SketchUp modeling could really become a problem when models progressed beyond a basic level of detail. SketchUp also needed a way to build complexity up from the bottom, a way to make assemblies of component objects. Enter "Components." Components have become the best-used and most essential model organizing principle in every expert SketchUp users' toolkit. Not only do components isolate geometry to keep it all from sticking together, but they give a simple way to think of a model as being composed of individual objects. Objects which represent something real. Over the years, we've extended Components more than any other single feature in SketchUp. We've added tools to slice them, dice them, add parameters and configure them. We've built a huge 3D Warehouse full of them, free for you to use as you see fit. We've added features to help you count them, analyze them and add any kind of data you can imagine to them. And our developer partners have extended them even more- there are more than 80 extensions in the Extension Warehouse that depend on some aspect of components to do the magic that they do. One thing we've noticed, though, is that all this great information and advanced capability that folks are adding to their models with components remains largely isolated inside their SketchUp models. What was missing (until now) was a way to add additional information to the model in some standardized way that would make it possible to share, analyze and extend it outside of SketchUp. And so in SketchUp 2014 we're introducing an open system of "Classification" that lets you build models made of components (make 'em yourself or add them from 3D Warehouse) that contain information in a structured way. Actually, in any structured way that you want. Want to adopt an open standard? We've got you covered. Or maybe you'd rather go your own way? Works for us, too. We're calling this simple combination of components and structured data "information modeling" and we think you're going to use it a lot. Classify groups and components and you'll find that their types auto-populate into labels and LayOut callouts (just like group and component names. Export an .skp (or an .ifc) and send your classifications along with the rest of your model. The most important thing about SketchUp's information modeling is that it offers you an unrestricted way to represent not just what a design looks like but also more of what it actually is. And you can do it without giving up the fast, fluid and 'free' modeling behavior that you fell in love with about SketchUp in the first place. To prove that this system works, we've built a special workflow around IFC— an open classification system for folks who are doing BIM in the construction industry. You can classify components in your models with IFC types, assign and edit relevant attributes to those components and then export the resulting models into the IFC format for use in other BIM tools. But don't stop at IFC. 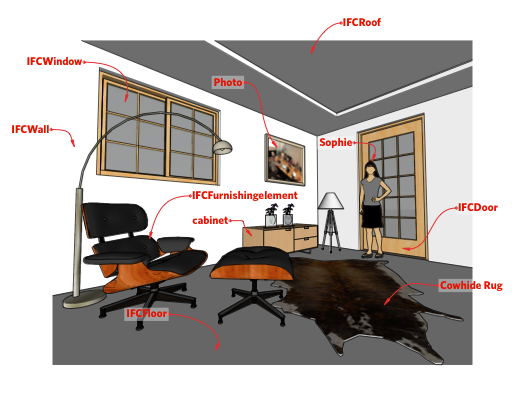 In SketchUp 2014, you're free to use any published schema to classify components in your models. Interested in COBie? Import the official COBie schema from BuildingSmart. Or maybe you're more interested in something like gbxml for green building, or CityGML for urban simulation. Or, you might just want to make your own classification system. We've got you covered however you want to work. Simple, open, easy… but powerful. Now that's the SketchUp Way.